In the wake of Sunday’s WWE Extreme Rules, the Architect begins his blueprint to take down the champ, and Money in the Bank qualifier matches begin for the right to risk life and limb to carry a cumbersome briefcase through TSA! Tonight on Monday Night RAW. Also, your intrepid reviewer attempts a new way to present this in a way to not turn off any more readers. A recap is a straight “give the results” article, a review editorializes. ’ll try and play Solomon and split the baby down the middle by presenting a straight recap, then my thoughts. We are live from Charm City, Baltimore, Maryland—the backdrop of two of the greatest television shows ever: Homicide: Life on the Streets and The Wire . The Facts: Seth Rollins has been waiting 200 days for this. He reminds us he never lost the title, and he fired the first shot to get it back at Extreme Rules. He’s perplexed by the cheers because they used to boo, criticize and undermine him but then something happened: his knee buckled under the weight of carrying the company. He threw away all of the fan mail and lit it on fire because he doesn’t need the fans. He rebuilt himself on his own and he’ll get the title back on his own. Roman Reigns comes down to the ring, but Rollins takes a walk once Roman enters. Shane McMahon interjects and brings both back into the ring for a conversation. The rematch has WrestleMania main event written all over it, but it’s going to happen at Money in the Bank. Opinion: Like many, I’m disappointed that Seth Rollins isn’t getting a face run on his return. I think had they run vignettes, had they kept him on the minds of fans, his return would have been something extra special and he could be a marquee star for the company. Of course, history mostly bears out that WWE errs on the side of blinders in such matters, preferring to concentrate on having one star as the focus of the brand. All others with momentum are then put into programs with said star. Seth Rollins isn’t going to be the guy many of us know he can be, and whatever shine he has, much like Dean Ambrose and AJ Styles before him, will be used to make Roman look good. That’s reality. That being said, the first half was an interesting “toe the line” segment as to what Rollins’ intentions were. The initial cheers turned into a smattering of boos and morphed into a unified “Welcome Back” chant. He did everything a good babyface did in basking in the cheers with an air of surprise without hamming it up to the point where we saw “the turn” coming. That said, perhaps it was a bit too subtle for the palates of most WWE viewers until the line about burning fan letters, but I enjoyed it. I also think Rollins/Reigns at Money in the Bank is somewhat unfortunate, as SummerSlam is a more marquee event, but I get the feeling they think a bigger name than Rollins should be slotted there, perhaps in the form of a John Cena, Randy Orton or Brock Lesnar. I’m of the opinion that even as a heel and a touch more viciousness, Rollins could have been that name, but that will have to go into the annals of fantasy booking for now until it materializes. The Facts: Sheamus has an interview with Renee Young, who reminds us he won the Money in the Bank contract last year. Sheamus advises parents to have children leave the room, as what he’s going to do will not be suitable for all audiences. This was a two segment match that had Zayn flying around for Sheamus’ power offense. Michael Cole’s commentary absolutely perks up after a powerful clothesline by Zayn followed by a Michinoku Driver. The end comes when Sheamus shoulder blocks an attempted Zayn dive but upon returning to the ring is caught with a Helluva Kick for the pin. Sheamus shows frustration in the ring following the match, and for good measure goes backstage and beats down Apollo Crews, who was giving an interview. Opinion: I have no idea what to think about Sheamus as a character, especially after perhaps the most insignificant title run next to Rey Mysterio’s. Building up as kingmaker for Reigns failed. Building him up as faction leader failed. He, to me, is another man who in a more “serious” era would thrive but is forced to be more whimsical than deadly. The match itself was solid, but Zayn was definitely moving a little slower following last night’s grueling Intercontinental Title match. Two months after a multi-man ladder match at WrestleMania, here he is again, in a multi-man ladder match. Probably with the endgame of a one on one ladder match with Kevin Owens. Michael Cole finally becoming engaged with the product versus constant doublespeak and shilling was nice. It was almost as if he was shocked that Sami Zayn had that much power, probably because Zayn is pushed as a small guy even though he’s merely thin and not short. The Facts: A birthday cake greets the New Day in the ring. It’s for RAW’s 1200th episode. Big E brings up that cakes don’t have a long shelf life, and they tease hitting people in the front row and the commentary team with said cake. The Social Outcasts (sans the recently departed Adam Rose) attack the New Day and do a Bo Train to celebrate. A triple team by the New Day knocks Heath Slater silly, leading to a comedy spot where a second Bo Train has Slater face plant and Xavier doing a somersault tope onto Bo Dallas and Curtis Axel. Slater is thrown back into the ring for a quick Midnight Hour for the pin. Slater gets clotheslined with the cake after the match. Opinion: A crowd pleaser segment to get a popular act on television. Slater is a great comedy patsy, but you can’t help but feel that all the humiliation now won’t earn him any future considerations. The Facts: Miz and Maryse play up Miz’s win at Extreme Rules. Cesaro is still working with the taped shoulder. Power moves by Cesaro to begin. The pattern then becomes Miz takes control working on the bad arm until Cesaro comes back with European uppercuts. The match culminates in Cesaro not being able to hold onto a Cesaro Swing after one revolution, Miz yanking on the arm over the top rope and trying to take advantage from the top turnbuckle, jumping into another European uppercut. A “Gotch Neutralizer” by Cesaro gets the pin. Opinion: Interesting that Cesaro has to work an injured shoulder but Kalisto can’t work a bad back, lest the kids go home unhappy. Miz doesn’t need to be in the Money in the Bank match, and in theory should be a top contender due to being the Intercontinental Champion. Maryse continues to be a positive for Miz’s act and she’s doing a lot more during the match to supplement the entertainment. The Facts: Renee interviews Seth Rollins, who thinks it fitting that Money in the Bank will be where he wins back the title. He sees Stephanie McMahon off camera and goes to give her a hug but is rebuffed. Stephanie informs him that business has changed, and the nature of their relationship has as well. Opinion: Seth is far more relaxed in these promos than before his injury. This is very conversational instead of feeling like it’s stilted exposition. The Facts: Chris Jericho is wearing many bandages as a result of the thumbtacks from his match at Extreme Rules. Apollo Crews is supposedly injured from the attack by Sheamus but isn’t showing it. Apollo dominates most of the match with aerial moves and strength while Jericho occasionally attempts his signature spots to no avail. After a Walls of Jericho is reversed into a small package by Crews for two, Jericho hits a quick Code Breaker to advance. Sheamus, prompted for a response on the result by Renee, laughs. Opinion: I understand what they were trying to do, and Apollo Crews got a good amount of offense, but this feels like a missed opportunity to make Money in the Bank a purely “New Era” match. To try and be positive, it means Crews doesn’t become the new Shelton Benjamin/Kofi Kingston/MVP. My largest gripe is it’s absolutely stupid to question whether a beatdown earlier in the evening will affect someone and not have that person show any effects to put said beatdown into the equation, or at least have it lead to a rising young superstar in need of some credibility losing due to the deviousness of the heel. Is Crews another victim of Vince McMahon’s infatuation with Big Cass? I personally don’t want Chris Jericho in this match. I realize part of this initiative to be in the ring with the hot rising stars is to push himself in this phase of his career, but at what cost? The Dean Ambrose match at Extreme Rules underwhelmed, not just in match quality, but the story wasn’t very compelling. The thumbtack spot was more than a man of his career should be taking, and I commend him for doing that, but now a crash and burn stunt show of a match like Money in the Bank? Don’t get me wrong, I think Jericho is very smart and this incarnation is a very good character, but as I’ve said almost on a weekly basis, aerial Jericho looks like he’s an older guy trying to recapture something and falling a bit short compared to the younger performers, and brawler/cagey veteran Jericho has yet to emerge. Again, my gripe is mostly the missed opportunity of a full on “New Era” Money in the Bank. The Facts: Big Cass comes out, and points to the back, and Enzo Amore has returned with more ridiculous hairstyles to the love of the crowd. Enzo makes light of his concussion, dabs and the two cut a promo on the Dudleyz using the metaphor of a luncheon meats. Match was a showcase for Big Cass’ size and power. They teased a distraction as D-Von attacked Enzo, but eventually got his comeuppance with a double team. Bubba Ray gets caught on the top rope for a slam, followed by an Empire Elbow for a win. Opinion: Interesting to see the Dudleyz this weak, but out with the old, in with the new. Cass still stumbles a bit both in the ring and on the microphone but a fine showcase for him. Enzo being back can be both great and grating depending on how long your tolerance is. I find him fascinating, but he needs to stop dropping the mic in his excitement during his entrance. The Facts: Pre-commercial, the three are shown walking backstage with Ric Flair’s Joker-esque grin encapsulating the mood. Ric starts with a rather emotional introduction talking about how proud he is of Charlotte. Everything she touched she made happen, he says. He compares Dana Brooke to Arn Anderson. Charlotte thanks herself and Dana thanks Charlotte for the chance to be in the same ring as Ric Flair. Charlotte then turns on her father, remembering how Ric wasn’t ever there. Charlotte is thrown off by the “What?” treatment and tries to go after the crowd but ends up losing composure and starts to rush through her lines a bit. She throws Ric out of the ring, but Ric doesn’t believe her. She accuses her father of not wanting to give up the spotlight. 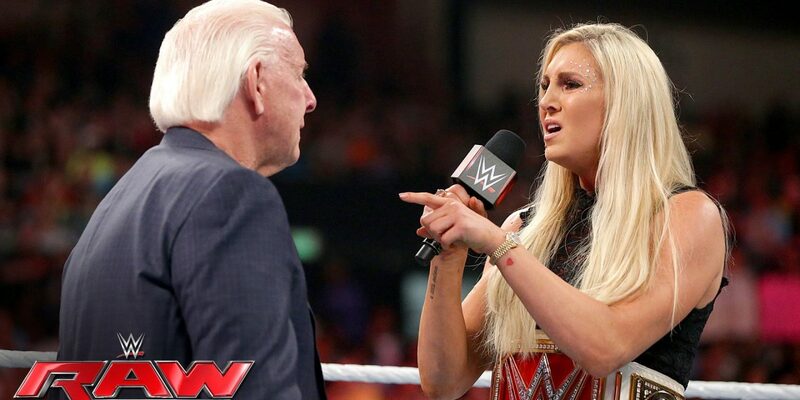 She’s not Ric Flair’s daughter, he’s Charlotte’s dad. Charlotte regains her center once Ric starts to cry. She calls her father “the second dirtiest player in the game” and she has no time for those who come in second. She tells Ric he abandoned her and that he might be immortal to the fans but is dead to her. She finishes by saying he can watch her on TV for the next 30 years like she did him. Later, they show Ric leaving, embracing Arn Anderson and blowing off an interview with Renee Young. Opinion: People are going to criticize this for a number of reasons, overall I thought this was a pretty good segment, but I can see how it would be polarizing. Charlotte still has issues getting rattled and forgetting lines, but once she focuses, she’s shown vast improvement. Ric Flair is a fantastic actor, conveying more while saying nothing, be it a grin or crying, than most people on the roster can do with 3 minutes of airtime. A couple of small things that were nice touches: Charlotte not ending on a musical cue, but rather an organic fade, as she’s still in the ring talking as the segment ends. I also liked the coda of Flair walking out, hugging Arn, and blowing off a Renee Young interview. This is what WWE does in “Flair Country,” they piss of Ric Flair fans. Baltimore was the home of many big Ric Flair wins. The Reid Flair line by Paige was done in Flair Country. Much like no matter how many times Dusty Rhodes said he doesn’t want to be remembered as the fat guy in polka dots, Ric Flair fans will never get the Ric Flair they remember with Vince around. Ric was slurring his words a bit and having problems enunciating during the introduction, and I think it shows it’s time to get Ric Flair off television. If this was the end of Ric Flair as a regular on screen character, I thought the sendoff was fine and did its job: separate Charlotte from her father and give Ric Flair a classy exit. The Facts: Darren Young takes notes, Bob Backlund doesn’t like it. Backlund says he should commit things to memory and orders Young to recite all the Presidents of the United States in order. An expletive sets Backlund off. Opinion: Meh, this is just going to get Darren Young closer to the unemployment line rather than rehabilitate him. Somehow. The Facts: JoJo asks Baron Corbin how he’s reacting to the criticism of how he beat Dolph Ziggler at Extreme Rules. Ziggler challenges Corbin to a technical wrestling match next week. Corbin doesn’t care about technical wrestling, just fighting. Ziggler tells Corbin pull up a chair for his Money in the Bank qualifier with Dean Ambrose. Opinion: JoJo being used to show how tall Corbin is, fine. Corbin talking too much about his backstory: not fine. Short, curt and to the point to me seems the way to go with him. Remember in Episode III of Star Wars how they turned Boba Fett from badass galactic bounty hunter of mystery to a crying orphaned child who watched his father get killed and thus made him lose that air of mystery? It’s the same principle. An even more egregious sin in professional wrestling storytelling: Ziggler brings back his “Steal the Show” line. Just win the match. The Facts: Ziggler hits his usual high flying moves, Ambrose his crazed brawling moves. A missed Zig Zag as Ambrose holds onto the ropes, which then leads to Dirty Deeds for the pin. Opinion: Is it possible for two people to have a decent match, but not to be engaging, and for no one in the audience to care? In a venue where these two could show creativity, give me this match any day of the week. As it was it just seemed like every other Dolph Ziggler and Dean Ambrose match of all the same spots with a couple of near falls. The match was fluid, action packed, and served no other purpose other than filling time. The audience refused to get involved, and in my opinion, it’s because no one believes either of these guys has a real chance of winning the Money in the Bank match. The Crews/Jericho match at least offered intrigue at the possibility of a fresh face in the mix. Either of these guys in the match screams reliable bumper inserted in order to sacrifice his body in the hopes his situation will change. The Facts: Before the match, AJ Styles cuts a promo telling us how good Roman Reigns is, turning the crowd’s goodwill against him. Styles says he had the match won if not for the Usos and the Club. Tonight he has an opportunity to beat Kevin Owens on his own. The Club interrupts, and Karl Anderson has an issue with what Styles just said. Styles says he wanted to do it on his own, and this isn’t Japan. Anderson agrees things have changed and Styles has changed. Luke Gallows says if they didn’t drop all of Styles’ opponents, Styles would have never made it to Extreme Rules. Styles suggests they professionally separate but stay friends. The Club don’t take the breakup well but leave when Styles calls it his ring. Owens and Styles begin the match with punches, and both take turns hitting each other hard, exchanging turns on offense throughout the match. The beginning of the end comes with Styles taking a powerbomb on the steps. After struggling to get back in the ring, Styles goes for a Phenomenal Forearm only to be cut off by a kick from Owens crotching Styles which leads to a Pop Up Powerbomb for a pin. Opinion: This match was set up at the Royal Rumble, and it main events a RAW with some stakes, but not as big stakes as they could have been. It was a great PPV level match, and I feel the crowd was clock watching to anticipate the end, thus denying the amount of excitement the match should have generated. From a story standpoint, it’s a curious choice to pin Styles clean. One could have taken the Ambrose/Ziggler match and put each with these two and not hurt anything. From a logic standpoint, it feels like every big match Phenomenal Forearm ends up with Styles getting beat. If this is the cool down, then hopefully the WWE sees how great Styles is making his opponents look and he has a job for life making lots of money, if for no other reason what he did for Roman Reigns on Sunday night. It was fascinating to set up a split between Styles and the Club and have no retribution, but to actually prove the Club’s point about their help is very intriguing to me. They also resisted the urge for a beatdown by the Club to lead to an Owens win, which feels like the play if you want to keep Styles in that upper echelon. It leaves the possibility that Styles will “repent” of his clean cut ways, but the smart money is he needs to enlist help against the Club, perhaps from a certain NXT star with ties to the Club or from a certain NXT star who has ties to Styles’ other previous workplaces. 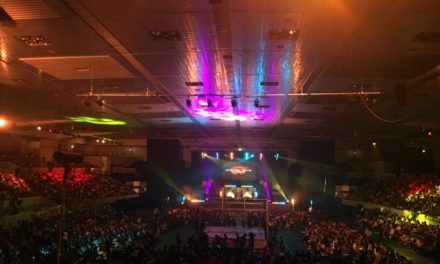 NextNew Japan Purocast – Best of the Super Juniors & more!